NO WONDER THEY PLAY OUT OF TUNE WITH THIN, REEDY SOUNDS AND ARTICULATE POORLY IN THE UPPER REGISTER! 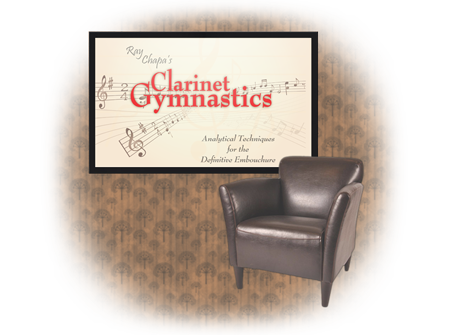 Ray Chapa's Clarinet Gymnastics offers consistency to a section full of inconsistencies and is already being hailed as a break-through in public school teaching. This beautifully packaged system offers an efficient clarinet embouchure via spectacular computer-generated animation. It is designed to captivate and motivate players at all levels. Technically simple exercises pinpoint existing embouchural deficiencies and offer a means of monitoring improvement. It is this feedback that has been lacking in traditional textbook and classroom approaches. 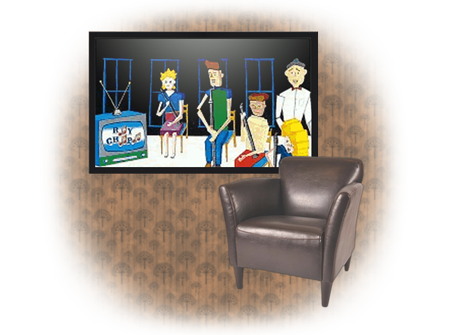 The 4-part DVD includes two segments for viewing in separate classroom sessions, a director's version which addresses implementation of the system, and a segment for individual student review. 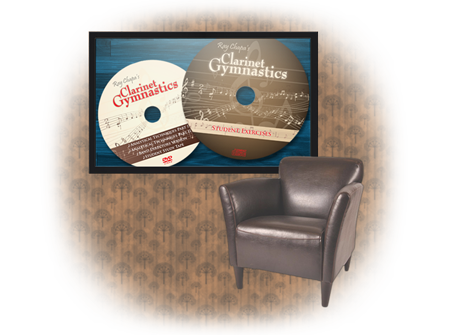 Set includes DVD, booklet & CDrom to print exercises.